Sukhoi SU-35 fighter jet after its test flight ahead of the 10th China International Aviation and Aerospace Exhibition in Zhuhai, south China's Guangdong Province, Nov. 9, 2014. Deal could be announced in March. Indonesia will buy 10 Sukhoi Su-35 jets from Russia, a source close to the Indonesian Defense Ministry told RBTH. The deal is likely to be financed in March when Indonesian Defense Minister General Ryamizard Ryacadu visits Moscow, the source said on the condition of anonymity, as he was not authorized to talk to the media. The Su-35 is an upgraded version of the Su-27 multirole fighter. Moscow and Jakarta have been in negotiations for the sale of the aircraft since August 2015. Indonesia would become the second country to buy Su-35 aircraft. 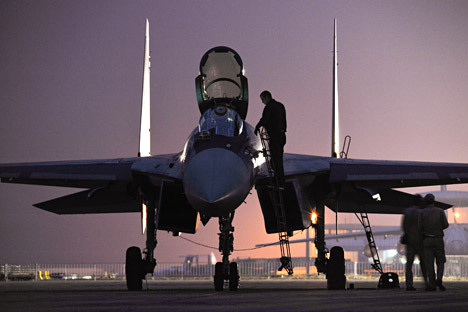 In 2015, China bought 24 Su-35s for $2 billion.